Albert Riera Galceran’s first solo exhibition of paintings is titled, simply, “Lust”. Riera Galceran connects the sexual desire or consuming hunger of the word, with the pleasure and satisfaction of painting, and the desire and yearning to live for, and from, art; living as artist as consummation, creative expression as climax. He invites us to think of his paintings as the products of an almost primitive urge; as objects of lust. In this series of paintings, Riera Galceran poses a question to the viewer. Is harmony in visual language something learned, or something intuitive? 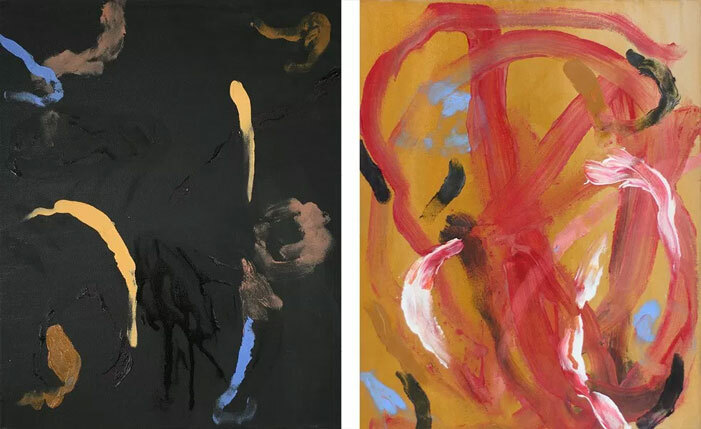 Strongly relying on impulse in his practice, the artist creates abstract shocks of colour, intuitively formed organic lines and shapes suggesting wildness and spontaneity. And yet the final images show balance, harmony and a visual language that belies an intellectual aesthetic sensibility as well as instinctive one. It is this juxtaposition that makes the works so compelling. While the hand paints through gesture and intuition, colour and form, the eye observes, almost subconsciously guiding the movement and analysing the form to create natural balance. It is Riera Galceran’s preternatural sense of colour and form which allow him to create energetic and unbridled compositions, with lustful vitality.